In Japan, Shizuoka Prefecture is considered to be the source of some of the country's best green tea. Shizuoka is to tea what the Napa Valley is to wine in the United States. Another reason that Shizuoka tea isn't all it's cracked up to be (this isn't just sour grapes, or sour tea) is that years ago, when Shizuoka tea started becoming trendy, the big food companies started setting up operations there. These behemoths don't exactly practice traditional agriculture: pesticides and other agrochemicals are liberally used in order to maximum yields for maximum profit. So, even tea that is actually grown in Shizuoka may be the product of a huge corporate farm. In short, it's not where the tea is grown that matters, but how it's grown. The majestic Mt. 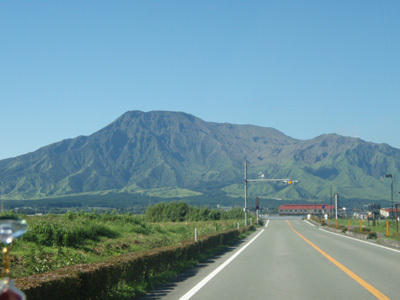 Aso, near where Mellow Monk tea is grown.